Montessori is just for preschool children. While the many Montessori schools in the United States are preschools, Montessori programs exist at age levels from birth to eighteen. Montessori is just for special learner-the gifted or the learning-disabled. The methods used in Montessori schools are highly effective with both learning-disabled and gifted learners. The reason for their effectiveness is that the learning environments have been designed to ensure success for all children. Montessori schools are religious. Many private American Montessori schools do have a religious orientation because it is such a common practice in America for private schools to have religious support. But Montessori itself is not religiously oriented and finds itself quite at home in public settings where religious instruction is inappropriate. Montessori is only for the rich. This misconception is due to the fact that the American Montessori movement that began in the 1950s was primarily a private preschool movement. Now Montessori education is available at approximately 200 public schools in the U.S. in addition to about 4,000 private schools. Children in Montessori classrooms are relatively unsupervised and can “do whatever they want.” Montessori is based on the principle of free choice of purposeful activity. If the child is being destructive or is using materials in an aimless way, the teacher will intervene and gently re-direct the child either to more appropriate materials or to a more appropriate use of the material. There is always freedom within limits in a Montessori classroom. Guidelines, ground rules, and work plans are always part of Montessori education. Montessori is a cult. 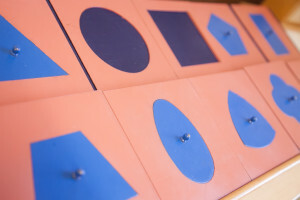 Montessori is part of the educational mainstream, as evidenced by growing numbers of graduate-level programs in Montessori education (such as those at Cleveland State University, Loyola University and New York University) and the increasing popularity of Montessori in the public schools. It is different, but is gaining. Montessori classrooms are too structured. Although the teacher is careful to make clear the specific purpose of each material and to present activities in a clear, step-by-step order, the child is free to choose from a vast array of activities and to discover new possibilities. Montessori is against fantasy; therefore, it stifles creativity. The fact is that the freedom of the prepared environment encourages creative approaches to problem solving. And while teacher-directed fantasy is discouraged, fantasy play initiated by the child is viewed as healthy and purposeful. In addition, art and music activities are integral parts of the classroom. Montessori classrooms push children too far too fast. Central to the Montessori philosophy is the idea of allowing each child to develop at his or her own, individual pace. The “miracle” stories of Montessori children far ahead of traditional expectations for their age level reflect not artificial acceleration but the possibilities open when children are allowed to learn at their own pace in a scientifically prepared environment.